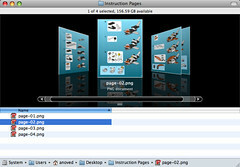 Here is an Automator application to save each page of a PDF file as an image. You can do this with Preview, but it is tedious for documents with many pages. 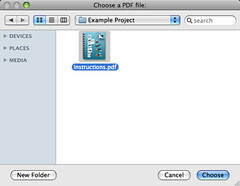 When you run the application, it begins by prompting you to select a PDF file. You can select any sort of file, but nothing much will happen if it’s not a PDF. Next you can choose the output image format. 150 DPI PNG is the default format. I don’t think the compression setting applies to PNG images, but it does apply to JPEGs. Rendering the images may take a moment. Then you’ll be asked to define how the output files should be named. I recommend the “Make Sequential” option. By default, page images from a three-page document will be named page-01.png, page-02.png, and page-03.png. Lastly, you can choose where to save the results. Choose “Other…” from the menu to select a folder that doesn’t appear among the default locations. Now you have an image of each page in the PDF. Posted on Tuesday, November 18th, 2008. Pdftk is a useful utility for manipulating PDF files. A Macintosh binary of the current version was not available, except perhaps from Fink or Darwin Ports, so I built it myself. My version is not universal, but it doesn’t require a package manager, either. Note: the default pdftk Makefile settings result in a binary that still relies on gcj. Until such time as this issue is resolved, the binary probably won’t be much use! Building pdftk requires gcj, which comes with gcc, but apparently not with Mac OS X. So, I downloaded and built GCC 4.2.2. Why 4.2.2? Because it was the most recent version. The --prefix option installs everything out of the way in its own little directory; I wasn’t really interested in upgrading to a new version of gcc just to build pdftk. The --disable-multilib option turns off some crap that caused build errors. Once that’s done, building pdftk is just a matter of pointing the makefile at the new gcc stuff. So that’s how you roll your own.